You have presentation of over 50Mb, for example, containing a number of pictures. It may be possible to make a very large reduction in file size. Make a copy of the presentation, so you can make a "before and after" comparison. Go to each slide in turn that contains pictures. Click on the picture. Go to "Edit" and then "cut" - the picture will disappear. 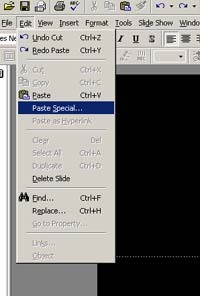 Then go to "Edit" and "Paste Special". In the box that appears, click on "Picture (jpeg)" and click OK. The picture will then reappear in your slide, with jpeg compression applied. The picture may have moved position slightly, or changed order in relation to text etc. (Compare with the original presentation) repeat the process for each picture. If the original pictures were inappropriately large, this technique can reduce the file size quite dramatically. The process can be repeated to compress the pictures further, but check that the image quality does not deteriorate. 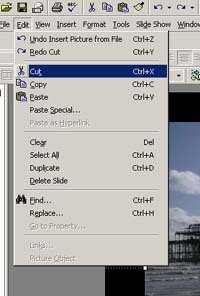 If you are using later versions of PowerPoint, (e.g. 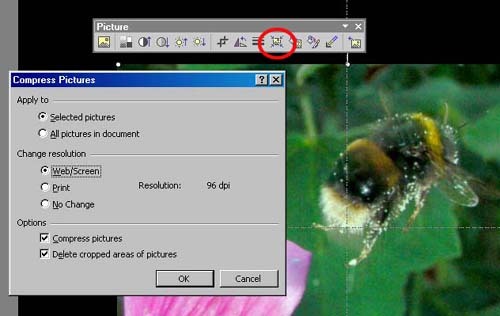 2003/XP/2007) there is an option on the picture tool bar to "Compress Picture" which can be applied automatically to all pictures in the presentation. With a slide on view, click on the photo, and from the picture tool bar, click on the "compress picture" icon. 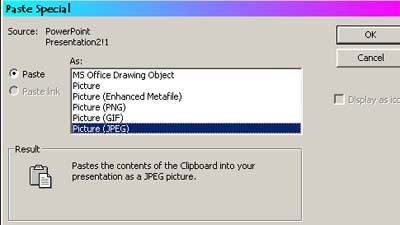 In the box that appears, select "web/screen" and "compress pictures" & "Delete cropped areas of pictures" Decide whether you wish this to apply to selected pictures or all pictures and click ok. You will be warned that this might lower the quality of pictures. Click Ok, and the pictures will be compressed. As always, have a back up of the presentation so you can check no important detail has been lost.